Voters could pull the plug on efforts to reconcile the eurozone’s need for growth with its inability to reform. Greek voters, foreigners worry, are on the verge of plunging the eurozone into another crisis if parliamentary elections on Sunday put an anti-euro party in power. That optimistically assumes a crisis can be averted if voters change their minds at the last minute. The bigger problem on display in this campaign is that another eurozone crisis is coming anyway. That’s not to minimize the severity of the jam into which Greek voters could push the eurozone. The left-wing Syriza party has a lead in the polls and an unrealistic policy agenda, to put it kindly. The party’s grand idea is that the rest of the eurozone is sufficiently desperate to keep Greece in the fold that the country’s creditors will accept significant write-downs on their debt holdings. Syriza also seems to think it can conjure up the billions of euros necessary to reverse hated fiscal tightening. It’s not clear that Greeks buy this. The party’s support, currently pegged at around 33%, appears to be wide but not deep. Polls suggest some three-quarters of the electorate want to stay in the euro. So with its bargain-hard strategy for dealing with the country’s creditors, Syriza is threatening to take a hostage that many of its voters presumably aren’t prepared to kill. Conventional wisdom holds that a win for the party should best be viewed as a protest vote against the current government rather than as an endorsement of the more radical elements of Syriza’s own agenda, something leader Alexis Tsipras would forget at his peril if he’s the next prime minister. But politicians perilously forget reality all the time. Hence the worry that Mr. Tsipras will overplay his hand in negotiations with creditors, and Greece will end up accidentally leaving the euro without a viable plan for what to do next. 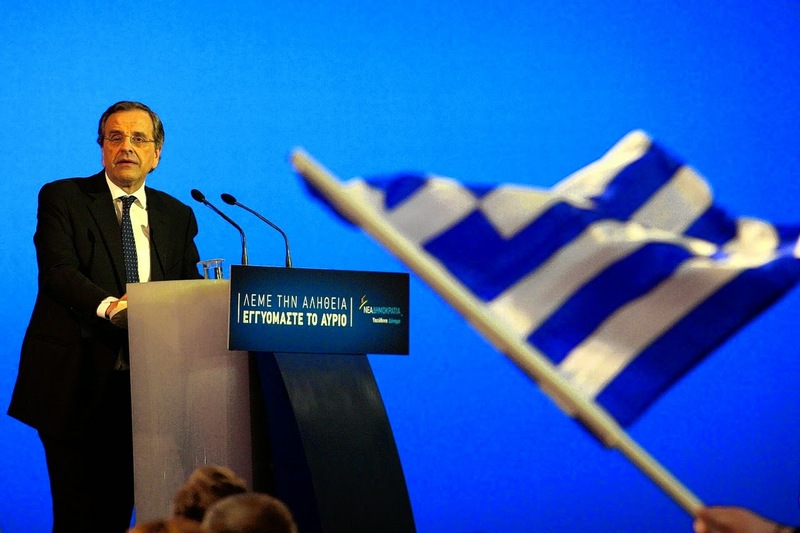 Not that the center-right New Democracy party and current Prime Minister Antonis Samaras are any better. Mr. Samaras trumpets the fact that Greece has posted a small primary budget surplus (excluding debt service) and the economy is returning ever so tentatively to growth. So what? This has been accomplished mainly through deep but erratically distributed cuts to salaries and pensions, coupled with steep and haphazardly imposed new taxes. Supply-side reforms are almost entirely absent. As a result, unlucky households are left earning less and still paying high prices to Greece’s politically powerful and unreformed sectors such as power and professional services. Mr. Samaras is on firmer ground with a campaign of fear, warning Greeks that a Syriza victory would precipitate a much-dreaded loss of the euro. But even under Mr. Samaras’s allegedly steady hand Greece has tripped into another moment of high drama. He may not be as willing as Syriza to take steps that could push Greece out of the euro, but he’s not willing to undertake the broader policy reforms that would assure Greece can stay in it either. Given those choices, it’s easy to see why cynicism is growing. The bright spot in this election is a party of professionals, Potami (“The River”), which could come in third on Sunday with enough seats to play kingmaker if Syriza doesn’t win an outright majority. Their status as political outsiders is a big part of their appeal. The fact that they’re mainly creatures of the center left could allow them to join a coalition government led by Syriza—and then, one hopes, moderate the larger party’s more radical urges. But at this early stage Potami still is more flicker than flame. Vague appeals to competence and “acting in the national interest” work fine in a campaign, but less so once a party needs to make decisions in parliament. Potami’s candidates and supporters encompass such a broad range of opinions about what constitutes the national interest, from libertarian to center left, that a lot of people inevitably will end up disappointed. The problem no one yet has an answer for is how successfully the old system has entrenched itself, as journalist Yannis Palaiologos describes in his illuminating study “The Thirteenth Labour of Hercules.” Greek politicians spent several generations divvying up spoils to those, mostly of the middle class, with the right connections. What remains now is a web of powerful unions, a bloated bureaucracy full of political hires, and a protected professional class that repulses all efforts at reform. They haven’t exactly benefited from the general malaise since 2009, but they’ve been shielded from its worst effects. They aim to keep it that way. This is different in degree but not in kind to what’s happening in many other parts of Europe. The fatal mistake Athens made was to conduct its patronage politics via an unusually large state sector, leaving the system vulnerable to acute fiscal strain. The Germans, French and Italians have developed very similar protected special-interest constituencies in their own economies. They’ve just been subtle enough to coddle their patronage networks not exclusively through handouts but also via strict labor laws and anticompetitive regulations that trigger a fiscal emergency only slowly by stifling revenue-generating growth. The main danger of a Syriza victory on Sunday is that the party might, deliberately or accidentally, pull the plug on half a decade’s worth of efforts to reconcile the eurozone’s need for growth with its political inability to reform itself. If, so far into this rolling crisis, no one anywhere yet has a handle on how to do that, the eurozone has far bigger problems than one parliamentary vote in a small Aegean state. Mr. Sternberg is editorial-page editor of The Wall Street Journal Europe. The US shadow banking nexus is coming back to haunt like some hydra-headed beast and now poses the biggest potential threat to the American financial system, the International Monetary Fund has warned. Zhu Min, the IMF's deputy chief, said regulators have successfully cleaned up much of the global banking system since the Lehman crisis, but the excesses have moved off books and are once again growing to disturbing proportions. "The key risk has shifted to shadow banking," he said, speaking at the World Economic Forum in Davos. While the explosion of China's shadow banking is well-known, Zhu Min said there has been a surge of lending by asset management funds and others non-bank players to US companies. This is outside normal control and is hard to track. "Non-financial corporations have raised $1.3 trillion (£860bn) through shadow banking in the US alone," he told the Telegraph. The IMF estimates that contingent liabilities of these shadow forms of lending have reached $15 trillion in the US, using a "broad" measure of activities that captures new forms of risk. This is higher than in China. It is roughly 180pc of banking assets and is rising rapidly towards its pre-Lehman peak. It is particularly worrying since it was a "run" on the interlinked world of structured finance that caused the global crisis to metastasise in 2008. Zhu Min said the oil price crash is "terrific news" for consumers but warned that its effects are double-edged and raise a whole new set of risks. It may set off a fiscal crisis in producer countries and a debt-repayment crunch for oil companies with $1 trillion of bonds. "There may be a spillover impact. It is a net positive but it should not be overestimated," he said. The concerns were echoed by David Rubenstein, head of the Carlyle Group, who said the slide in oil prices to $50 a barrel is likely to set off a chain of defaults by Russian companies that owe $650bn of external debt. "They can't service the debt. And who owns that debt? It is nearly all held by European banks. They are going to be hurt, and I suspect that currency turbulence in Europe is going to hurt them too," he said. Mr Rubenstein raised the disturbing possibility that the West is already at the end of the post-Lehman growth cycle, rather than at the start of a new expansion as most people assume. "Typically we have had a recession about every 7 years, and we are now at the end of seven years. Something is going to happen in the US that we're not expecting," he said. The SNB depegging from the Euro should not have shocked the world. The move is good for the Swiss, not bad. They were the first, they won't be the last. If anyone had any doubt how severely the global economy has been distorted by the actions of central bankers, the "surprise" announcement last week by the Swiss National Bank (SNB) to no longer peg the Swiss franc to the euro should provide a moment of crystal clarity. The decision sent the franc up almost 30% in intraday trading, a scale of movement that is unprecedented for a major currency in the modern era. Although very few in the media or on Wall Street fully understand the ramifications, the situation that forced the Swiss to abandon the peg will soon be faced by bankers of much larger countries in the coming years, the implications of which can have more profound implications for global financial markets. Other than the immediate fluctuations in exchange rates, the primary reaction to the Swiss move has been indignation. The airwaves have been awash with officials and investors who have felt betrayed by an irresponsible bank that has not only squandered its own credibility but has also damaged the reputation of all central banks. Despite the complaints of now-ruined foreign-exchange speculators, who believed recent statements from the SNB that it would continue to enforce the peg, a blindsided policy reversal was its only viable option. Any hint that the policy was about to change, or could change, would have resulted in the same mass buying of Swiss francs. But the only thing the SNB did wrong (other than initiating the peg in the first place) was to admit that the policy was unsustainable and have the courage to reverse course. In so doing, they violated the first rule of central banking, which appears to be: Never admit to making a mistake. Although the move is not as dramatic a change as the recently defeated gold reserve referendum would have likely produced (see my prior commentary), the abandonment of the peg makes Switzerland the first major economy to surrender in the international currency war. It has decided not to race to the bottom, and it has understood that a cheap currency does not solve economic problems. The decision gives a long-delayed victory to the Swiss people. With a centuries-old legacy of economic independence, the Swiss initially had the good sense to avoid joining the monetary quagmire that became the Eurozone. But with the 2011 euro peg, the country de facto joined the currency union. This tasked a country with a population of just over 8 million people to support the euro, a falling currency used by 335 million people locked in a dysfunctional political union, with governments that have been serially unable to deal with horrific debt profiles. According to tradingeconomics.com, 2013 figures show Switzerland has a debt-to-GDP ratio of just 35.4%. In contrast, the Eurozone has an extremely high ratio of 90.9%. Taking on that kind of dead weight was a very big job for a very small country. Predictably, the numbers got very silly very fast. In 2009, Switzerland's foreign exchange reserve was $92 billion (SNB Annual Report), representing just 17.5% of its annual GDP. This was high by national standards, but well within the range of most developed countries (The U.S. now has almost no foreign exchange reserves - just .9% of GDP). But in order to maintain the peg, the SNB had to buy hundreds of billions of euros annually. Over the past six years, the tab came to almost $10,000 per year per Swiss citizen. These are enormous sums, even for a rich country. As a result, by the end of 2013 Switzerland's foreign exchange reserves had swelled to $488 billion (SNB Monthly Statistical Bulletin, Dec. 2014) or 71% of its annual GDP. This dwarfs the reserves-to-GDP levels held by the globe's two primary foreign exchange depositories, China (41.3%) and Japan (24.4%). In retrospect the task was absurd. It was like asking a 100 lb. jockey to perpetually piggyback a 600 lb. sumo wrestler. But the real problem came in recent months when the European Central Bank came closer to announcing a program of quantitative easing, which would have brought even more downward pressure on the euro, requiring the SNB to pick up the buying pace even further. Asking the Swiss to shoulder the QE burden was like asking the jockey to carry the Sumo wrestler into an all-you-can-eat sushi bar. Given that grim reality, the SNB had no choice but to lay down its burden. Despite this prospect of an open-ended euro buying cul-de-sac, mainstream economists have argued that the move will decimate Switzerland's finances and ruin its economy. They argue that by letting the euro fall, the SNB will suffer immediate losses on the hundreds of billions of euros it now holds in reserve. While this is true, it ignores all the hundreds of billions, if not trillions, of francs that the Swiss would have had to spend (to buy euros) in coming years to maintain the peg. Modern economists believe that the money needed could have been printed out of thin air with no cost to the Swiss economy. But to believe that is to believe in fairy tales. But when you look at it clearly, Japan, China, and many emerging economies find themselves in roughly the same boat as Switzerland. They are continually inflating their own foreign exchange reserves in order to enforce an unofficial peg against the U.S. dollar. However, in no other country has the relative scale of foreign exchange purchases been as dramatic as in Switzerland. But if the Fed unexpectedly launches another round of QE, which I believe it will, then the rest of the world will have to face the same decision as Switzerland had; whether to continue to throw good money after bad, or to cut and run and take the pain now. Those still in shock by what they see in the rear view mirror had better focus their attention on what lies ahead. To me, the mother of all pegs is the one provided by China to the U.S. dollar. Both the yuan and the Hong Kong dollar are pegged to the U.S. dollar, and China has spent far more money than Switzerland defending its peg. Should China pull the plug on the dollar, our economy has a much larger drain to go down. The Europeans had only recently begun to rely on Switzerland, yet America has been limping on China's crutch for decades. Since our reliance is much greater, so too is the potential impact once it's removed. Another difference is that while the Swiss are few in number relative to the population of the Eurozone, per capita income in Switzerland is higher. In contrast, China has a larger population than the United States, but its people subsist on much lower incomes. So it's not the rich subsidizing the less well off, but the Chinese poor subsidizing America's middle class. As a result, the immediate gain to China and loss to America will be that much greater than is the case with Switzerland and Europe. In the future the Swiss surrender may be looked at as the first significant counter-attack against our current global system of monetary insanity. The mistake was not ending this peg, but in adopting it in the first place. The Swiss once again have a strong currency with expanded purchasing power. Yes, Swiss exporters may lose market share to international rivals. But the amount of Swiss francs they will actually earn from each unit sold will likely increase. So the Swiss may be able to export less and still earn the same money. In addition, the cost of imports will fall, allowing the Swiss to buy more with less. Contrary to the common current belief, the goal of an economy is not to manufacture more products for others to buy, but to be able to buy more products yourself. In that respect, exports are merely the means to achieving that end. The less you need to export to pay for your imports the better. In other words, the goal of an economy is to consume, not to work. If we could consume without working we would happily do so. Working without consuming, not so much. In the past, the Swiss prospered with one of the world's strongest currencies. It will do so again. Ironically, without the support of the SNB in propping up the euro, full-blown European QE may now be a more remote possibility, and a euro rally against the dollar may not be too far off. Goldman Sachs noted the Swiss' message is that QE is going to be done and perhaps even larger than previously thought. But, with tough love from Switzerland perhaps the European Union may choose to consider real economic reforms rather than risk QE without a Swiss safety net to catch the euro if it starts to tumble uncontrollably. In fact, the forces now in motion, accelerated by the SNB's move, may push the Fed that much closer to launching QE4. Since the "long dollar, short euro" trade is predicated on the expectation of QE in Europe and rate hikes in the U.S., if we end up with QE4 in the U.S. and no QE at all in Europe, the fireworks in the foreign exchange market are just getting started. Pedestrians walk past restaurants and shops on East 4th Street in downtown Cleveland, Ohio, U.S. A small downturn in the U.S. economy, “just enough to make people say maybe rates aren’t moving higher, the Fed is on hold -- that could take some of the sheen out of the dollar’s shine,” Greg Peters, a senior investment officer at Prudential Financial Inc.’s fixed-income business in Newark, New Jersey, said Jan. 15 by pone. After Switzerland shocked markets by scrapping its currency cap, investors are beginning to ask whether a policy surprise may be lurking for the dollar, too. Samson Capital Advisors LLC said the Swiss move, which sent the franc surging as much as 41 percent against the euro last week, was “a good reminder” of the risks of following the herd, just as speculators pushed bets on a dollar rally to a new high. A shock from the Federal Reserve, such as raising interest rates less quickly than investors expect, may derail the greenback after it advanced to the highest in a decade, State Street Global Advisors Inc. warned. Bloomberg’s Dollar Spot Index -- which tracks the U.S. currency against the euro, yen and eight others -- is headed for a seventh straight monthly advance on the assumption the Fed will raise its zero to 0.25 percent benchmark rate in coming months. At the same time, traders expect Europe and Japan to debase their currencies by flooding markets with more cash. Only now, after being shocked by the Swiss National Bank, some investors are asking: What if we’re wrong? A small downturn in the U.S. economy, “just enough to make people say maybe rates aren’t moving higher, the Fed is on hold -- that could take some of the sheen out of the dollar’s shine,” Greg Peters, a senior investment officer at Prudential Financial Inc.’s fixed-income business in Newark, New Jersey, said Jan. 15 by phone. His division oversees $534 billion of bonds. It’s the extent of the dollar positioning that’s causing angst. Hedge funds and other large speculators pushed net wagers on the dollar strengthening versus eight major peers to a record 448,675 contracts in the week ending Jan. 13, according to the latest data from the Commodity Futures Trading Commission in Washington. Forecasts in Bloomberg surveys still see the U.S. currency gaining versus all but nine of its 31 most-traded peers by year-end, after climbing against all of them in 2014. Bloomberg’s dollar index rose to 1,147.54 on Jan. 8, the highest closing price since it started at the end of 2004. Even so, a trade-weighted measure of the greenback versus the currencies of its major trading partners remains short of its peaks in 2009, suggesting the dollar rally has further to go. This has helped convince investors to speculate on a stronger dollar and, some say, left them vulnerable to the whims of policy makers. “If we do have outcomes, either from the Fed that are less hawkish, or outcomes from the European Central Bank that are less dovish than are expected, those two could conspire” to hurt the dollar against the euro, Collin Crownover, the Boston-based head of currency management at State Street, which oversees about $2.4 trillion, said by phone on Jan. 16. That same day, the euro tumbled to an 11-year low of $1.1460 on speculation the ECB is preparing to announce currency-depreciating sovereign-bond purchases. Europe’s shared currency was at $1.1604 as of 8:38 a.m. in New York, having fallen 4.1 percent since the start of this year. There are already signs the U.S. central bank may be pulling back from a possible rate increase around midyear. Fed officials urged “patience” on monetary policy at their December meeting, noting risks to the economy from lower oil prices and weak overseas growth. Futures contracts now show about a 50 percent chance the U.S. will raise rates to 0.5 percent or higher before October, while at the end of last year traders were betting on a September increase. Bullish-dollar positioning may convey a sense of deja vu among investors. Speculators boosted positions on the franc weakening against the dollar to the highest in 1 1/2 years this month, CFTC data show, only to be burned by a 21 percent jump to a more than three-year high on Jan. 15. The franc also posted an unprecedented 23 percent rally against the euro that day after Switzerland abandoned the cap that had been in place since 2011. The Swiss announcement was all the more unexpected because, two days earlier, SNB Vice President Jean-Pierre Danthine re-affirmed the currency peg as a “pillar of our monetary policy.” Central-bank President Thomas Jordan’s insistence that surprise was necessary only sowed more doubt in the minds of investors about their other currency positions. Reports of heavy rocket artillery firing on the eastern parts of the city of Mariupol, Ukraine, as well as a statement made by a separatist leader, indicate the potential preparation of an offensive on the city. 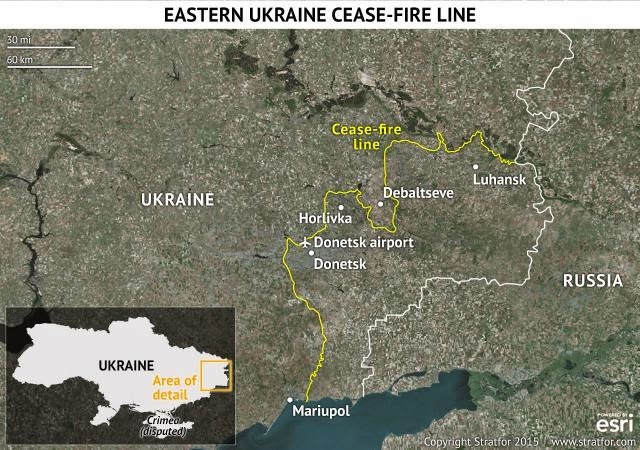 While this would be a significant escalation and an indicator of Russian intent to push further into Ukraine, potentially forming a much-rumored land connection to the northern border of Crimea, there are also several indicators required for such an offensive that are currently still missing. Reports of heavy rocket artillery firing on the eastern parts of the city of Mariupol have been widely reported, with the death toll rising to 27 people. Mariupol has been shelled in the past, notably in early September, but as the cease-fire took affect separatist forces generally conducted attacks only outside of the city. It is not clear whether this is simply an intensification of relatively static fighting along the front between Russian and pro-Russian forces on the one side, and Ukrainians, or the beginning of a Russian-led offensive to widen the pocket, or the opening move in a broader strategic offensive to link up with Crimea, 200 miles to the west of the pocket. The widespread use of Grad Multiple Launch Rocket Systems indicates that this is a planned action with significant logistical support that it involves extensive use of Russian troops, though Grad fire has been widely used throughout the conflict. There have been indications that Russian forces, including Russian Marines, have moved into the eastern Ukraine pocket controlled by pro-Russian forces, giving the Russians offensive options. Heavy artillery preparations frequently precede Russian attacks, particularly by concentrated MLRS attack. Given the amount of munitions needed to supply concentrated fire, the Russians tend not to use them casually. The presence of Grad missiles indicates the possibility of artillery preparation for a broader offensive. The attack comes days after the Russian forces secured the Donetsk Airport, important in defending the right flank of any offensive westward. It also comes days after Lt. Gen. Ben Hodges, commander of U.S. Army forces in Europe, came to Ukraine and publicly announced that a small number of U.S. Army trainers would be arriving in Ukraine. While any large-scale offensive would have been considered and planned for much longer, the decision of the United States to send Lt. Gen. Hodges could have affected the dynamic of internal Russian calculations. In any event, we do not yet know Russia’s strategic intentions. This could simply be an attempt to signal the danger Russia could pose to their negotiating partners in the west. It could be an attempt to extend the pocket they hold modestly. It could, finally, be the opening of an offensive toward Crimea. The Russian position in Crimea is untenable. Crimea is easily isolated should Ukranian forces strengthen or Western forces get involved. Russia holds Crimea only to the extent that the West chooses not to intervene, or to the extent that it extends a relatively wide and robustly defended land bridge from Russia to the Crimea. Crimea and the Sevastapol naval facilities are of strategic importance to Russia and the decision to hold these facilities but not extend their power makes diplomatic sense, though it is not militarily rational. Either Russia can build the geographical structure to support Crimea, or it becomes a permanent weak point in the Russian position. The Russians do not want a massive confrontation with the West at a time of economic dysfunction, yet at the same time, having made the decision to hold Crimea, they will not have a better moment for consolidation. This is an ongoing conversation in Moscow. It is not clear that it is over. The artillery may simply be a minor probe or it could be the preface to an assault. We know that there has been a significant increase in Russian presence in the pocket, but it does not seem to us that the Russians are logistically ready for a major offensive yet. Taking Mariupol is a first step to a broader offensive. It is also an end in itself, anchoring the southern flank in the city, though may not even be that. However, the MLRS barrages on Mariupol open the door to multiple avenues of exploitation and have clearly moved the fighting to a new level, not so much in intensity, but in raising serious questions of strategic intention. The encouraging trends are a flashing yellow light for both parties and their 2016 campaigns. As the players begin suiting up for 2016, the playing field is shifting in ways that will affect the strategies of presidential aspirants in both parties. Optimism about the future is rising. So is the public’s approval of President Obama ’s performance. As worries about the economy and job creation diminish, other issues—such as terrorism and foreign policy—are increasingly matters of public concern. Every major survey conducted in January shows a significant improvement in the mood of the country. The CBS News poll finds that 38% of Americans now think that things are going in the right direction, compared with 27% in October. For the NBC/Wall Street Journal, that percentage stood at 31, up from 27% in December. Among all Americans, the ABC/Washington Post survey found 39% with a positive view of the country’s direction, up 12 points from a year ago. In response to a slightly different question, 32% of Americans told Gallup researchers that they were generally satisfied with the way things are going, up from 23% in December; 31% offered that response to the Pew Research Center, up from 26%. According to Gallup and ABC/Washington Post, the gain shows up among Independents and even Republicans, not just Democrats. This shift is correlated with an improving assessment of the economy. The ABC/Washington Post survey found that 41% of Americans now view the economy as excellent or good, up sharply from 27% just three months ago. Forty-five percent of the NBC/Wall Street Journal respondents said they were very or somewhat satisfied with the state of the economy today, up from 36% in early November. Gallup’s Economic Confidence Index—a composite of current conditions and perceptions of the economy’s trajectory—now stands at the highest level since Gallup inaugurated it in 2008. In January 2014, only 35% of Americans said they were better off than a year ago, compared with 42% who said worse off. Now, fully 47% say they are better off, while the number reporting declining personal finances fell sharply to 28%. Here again, the reported improvements are broad-based—7% among Republicans, 14% for Independents, 16% for Democrats. And 65% expect their finances to improve in the next 12 months, just six points shy of the peak recorded in 1998. Asking different questions, Pew finds that 27% of Americans now say that economic conditions are excellent or good, up from 16% a year ago; 24% say that economic conditions are poor, down from 39% in January 2014; 31% expect the economy to be better a year from now, compared with only 17% who think it will be worse. Thirty-eight percent think that the president’s economic policies have made conditions better; only 28% think the reverse. As the Pew researchers note, this is the most positive rating of President Obama’s impact in more than five years. Not surprisingly, the president’s job rating has risen significantly. According to Pew, 47% of Americans now approve of Mr. Obama’s performance, up from 42% last fall. ABC/Washington Post found the identical level of approval among registered voters; NBC/Wall Street Journal, 46%. A broad-based average of national surveys conducted during this period finds a similar increase. Mr. Obama is now in a statistical tie with Ronald Reagan at the beginning of his presidency’s seventh year. 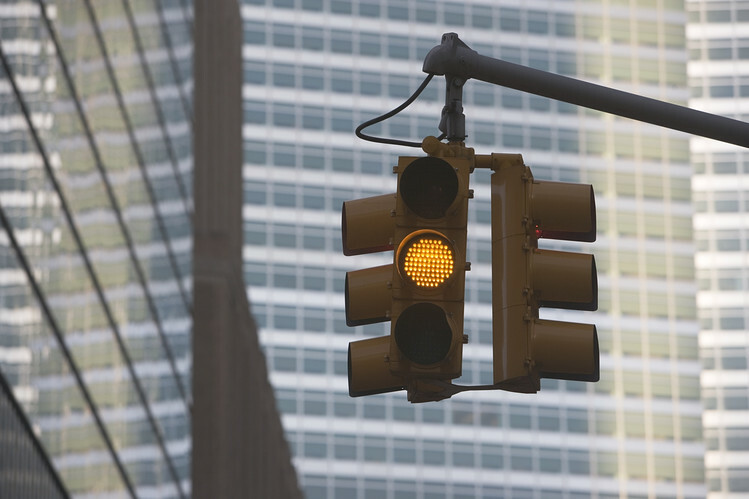 These trends are flashing a yellow light for both political parties. On the one hand, Americans express more confidence in the president’s approach to the economy than in Republican leaders, and they are divided almost evenly on the question of whether history will judge him to have been successful or unsuccessful. Republicans gearing up to run against Mr. Obama’s “failed policies” should rethink their approach. On the other hand, Americans have managed to curb their enthusiasm for recent developments. According to Pew, 66% say that the economy is recovering but not strongly; 57% still say that jobs are hard to find in their local areas. And 55% say that their family’s income is failing to keep up with the cost of living. Thirty-seven percent say they are staying about even, and only 6% think they are getting ahead. This assessment is widely shared, among men and women, racial and ethnic minorities as well as whites, Democrats and Independents as well as Republicans. Democratic candidates do not yet have the luxury of running “let us continue” campaigns. Everything now depends on the trajectory of real wages and household incomes over the next 18 months. If they trend up noticeably, validating the current wave of optimism, we will have one kind of national election. If they do not, the Democratic nominee will be pressured to go beyond Mr. Obama’s policies, the Republican nominee will have to lay out a new conservative agenda that redeems the promise of real gains for working- and middle-class Americans, and economists of every persuasion will be called upon to explain how wages can remain stagnant even as labor markets tighten.